"Jurassic Park" movie, the gigantic thunder lizards from prehistory come crashing in to the modern day. The three-film franchise has made $2,075,654,626 around the world. It not only says that children are crazy about dinosaurs. A "Jurassic park" novel by the late Michael Crichton tells the story of scientists cloning dinosaur DNA, results in brand new dinosaurs. The first "Jurassic Park" in 1993 was directed by Steven Spielberg and based on the novel of the same name by Michael Crichton. The film centers on the fictional island Isla Nublar in Costa Rica, where billionaire philanthropist John Hammond and a team of geneticists from his company have created an amusement park of cloned dinosaurs. 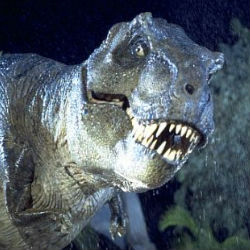 "Jurassic Park" is regarded as a landmark in the use of computer-generated imagery, and received positive reviews from critics. The film grossed more than $914 million worldwide. It’s the 16th highest grossing feature film and financially successful film for NBC Universal and Steven Spielberg. Its sequel, "The Lost World: Jurassic Park" in 1997 was directed by Steven Spielberg, was based on the novel of the same name by Michael Crichton. Fans and critics pressured Michael Crichton for a sequel novel. He originally declined, but when Steven Spielberg finally started pressuring Crichton, a sequel novel was produced. Although the film is said to be based on Crichton's novel, exactly one scene from the book was used in the movie. "Jurassic Park III" in 2001 science fiction film is a sequel to "The Lost World: Jurassic Park." It is the first in the series not to be based on a book by Crichton. The film was a moderate success, and had mixed reviews from critics. Most were split on whether the third installment was better or worse than its precursor, where the film once again suffered reviews mentioning little to no characterization.